Hardcover. Good. 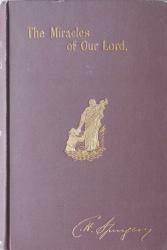 First Edition (1909). Original dark brown cloth with decorative gilt on front; gilt lettered spine. Rubbing of corners & spine ends. Original black end-papers. Nameplate inside front cover; 2 name labels on ffep/one on half title page. Previous owners' names (2) written on back of half title page. Bottom inch of half title & title pp detached. Browning of text. Text is free of marks, underlining, notes, etc. No foxing. No DJ.